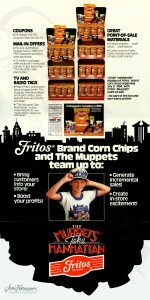 To market Jim’s third Muppet feature film The Muppets Take Manhattan, there were numerous movie-themed products and promotions with Cheerios, Frito-Lay, Oral-B toothbrushes, and various Post cereals in Canada. The standard television and print marketing was put in place, there was a special movie magazine filled with production photos, and as was done for The Dark Crystal and Labyrinth, Jim’s team created an exhibit to celebrate the film. It was displayed in a historical building called “The Dairy” in Jim’s backyard, New York’s Central Park (a featured location in the film), and ran from June 30 – Sept 3, 1984. Learn more about promotion of The Muppets Take Manhattan. 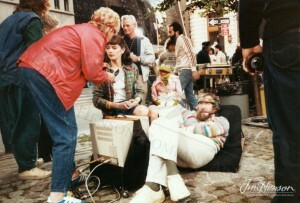 Jim and Kermit shooting The Muppets Take Manhattan with “Jenny” played by Juliana Donald, 1983. Brochure relating to the Frito-Lay promotion of The Muppets Take Manhattan, 1984. 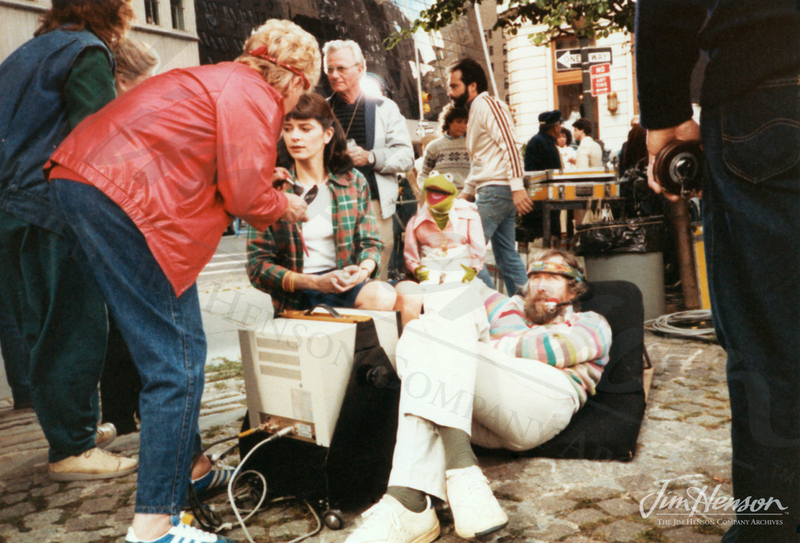 This entry was posted in 06-June '84, 1984, Muppets Take Manhattan and tagged Central Park, New York. Bookmark the permalink.